There are not enough writing talents like Stephen King who seldom takes more than a cigarette’s length (non scientific measurement of time representing a period of time taking to consume a cigarette) to establish the character and its motivation. “On Writing” is a partial memoir and partial writing guide. He does not take more than a cigarette’s length to establish his motivation to write this book. There is so much to learn from one of the finest writer of the era. He is not the kinds who wins major literary awards but he is always respected by both the readers and his peers as one of the best storytellers of his generation. But this book is not all about how to write. He starts with his memoir, his childhood and his upbringing. He tells the stories of his brother and his mother, how he met his wife, and how they all contributed in his writing career. In his own style of modesty, sometimes he make it sound like an accident but he does mention his love affair with reading, humor, sci-fi and scary stories. It is a cliche when successful people write how they handled rejection and failures to come back stronger and better than before. Mr King knows that there is no way to avoid this cliche because that seemed the way his career graph worked. His focus on the second half of the book was on the craft of writing. Perhaps it is the single most important piece of literature available for the inspiring writers. I have attended few writing workshops, lectures and read fairly large number of articles on it. I believe all these workshops and lectures had an essence of this book. I can’t think of any writing coach who has not mentioned the advice given by King in his book. In India, students are usually left confused when it comes to writing style. While most of them are fed classics in their literature classes, they are excepted to follow the outdated journalistic style in writing consisting of introduction, body and conclusion. It is not only in writing, but also evident in speech or school debates. Everything is template driven and it goes from school to corporate to government organization. It is important that schools incorporate creative writing and encourage students to try things out of the templates. Also, inclusion of modern literature in the curriculum will improve the perception towards reading and writing in general. 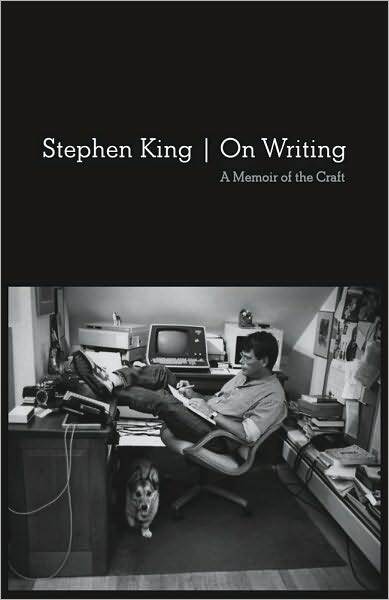 I gave “On Writing- A Memoir of the Craft” by Stephen King 5 out of 5 stars in the goodreads. There is no better way to educate yourself about the craft of writing. Thank you Uma. I agree that many schools have started encouraging independent writing but still we have to over lot of ground. Hahaha. Absolutely. So when is your Mumbai yatra ? Avinash, this is one book I’ve read many times. I find it so uplifting to read Mr. King’s words. As for template, most of the books these days (even out of template ones) are meh! Thank you Parichita. I agree with you Mr King is really motivating and I will read this book many times to keep me motivated. Heard about the book, yet to read though. Definitely will grab it this time 🙂 Loved the way you’ve discussed the book. Given all the straightjacketing, perhaps it is the lucky ones who don’t get trained at all. Since they know no rules, they break all the rules- or create their own rules. What say? I will only partially agree with you. I think so coaching helps in keeping out the errors that are too obvious. I do agree that some writers are more natural than others and can shine without formal training but if we focus on the craft part of writing, there are some rules that works with everyone, obviously with exceptions. Hmm, I agree about teaching grammar. I mean,no matter how exceptional the writing, it can get murdered by bad grammar. Only, coaching shouldn’t produce an army of clones. That, of course, is the coach’s skills – to impart knowledge without taking away spontaneity. True. Especially one who can cut off the unwanted , bulky extra stuff. aka Editing. I’m reading this very engrossing book and loving it to the T. So glad to find a review that echoes with me. Nice blog here. Will be back for more.